Sclerotherapy is very successful and the most popular method for eliminating spider veins. 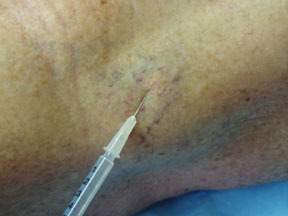 In this procedure, a tiny needle is used to inject a medication directly into the vein. This medication causes an irritation to the inner lining of the vein and results in closure of the vein. With time, the vein disappears. Most people experience little discomfort during the injection. The treatment takes approximately 15 minutes. Treatment differs from patient to patient. Generally, two to four treatments are required. For optimal results, the treatments are scheduled four to six weeks apart. If the initial treatments are successful, the treated veins are either gone or much less noticeable. However, many patients develop new spider veins and a yearly “touch up” may become necessary.